Laying out a display is hard work..
..especially if you have almost no technical constraints in what you can implement. It’s only pixels, after all. 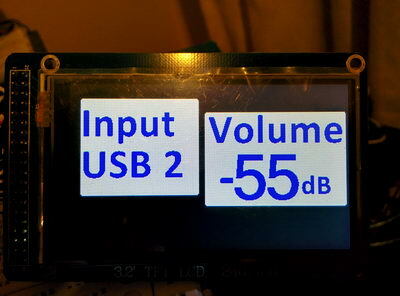 Yes, I am talking about a new version of the TFT HiFiDuino code with a new look and feel. This of course is very very preliminary, and chances are the final version will look almost nothing like it, but still it will give you an idea as to where I’m going with the design. The new version will have a minimal main display and only show the good stuff when an adjustment is to be made. The underlying code is nearly complete, but I’m struggling with the aesthetics of the thing. This entry was posted in TFT Hifiduino (code) and tagged Arduino, TFT, tfthifiduino by Dimdim. Bookmark the permalink.